Optimizing your website and content for keywords is one of the most important factors in SEO. It doesn’t matter if we’re talking about website structure, content creation or link building keywords are the foundation of your site. This is a critical factor for long-term success for most websites. There is a wide variety of ways to do keyword research. If you do anything with SEO or have a subscription to any blogs relating to SEO or content marketing then I’m sure you aren’t short on information about keyword research. The goal of this article isn’t to rehash over “How to do keyword research”. I’ll cover a couple methods but the main focus is how to use your keyword research for designing your website and content structure to help improve the ability of your website to rank. Backlinko’s “Keyword Research: The Definitive Guide”. Neil Patel’s “The Advanced Guide To SEO”. 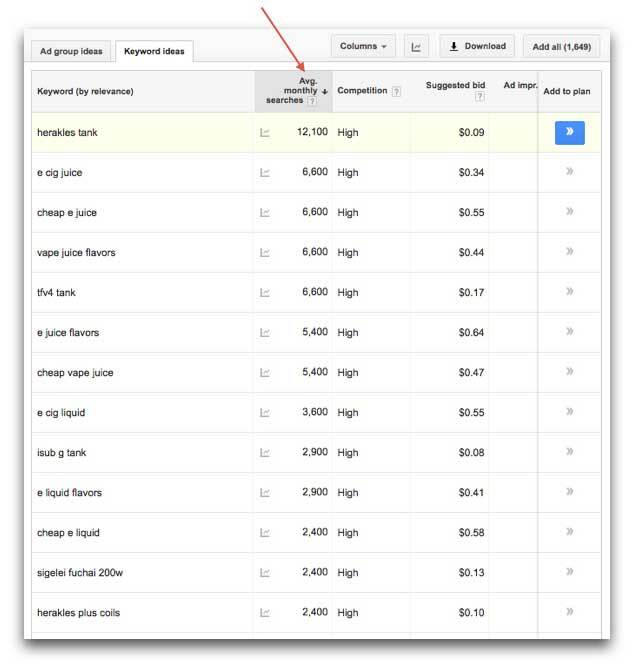 Shopify’s “The Beginner’s Guide To Keyword Research For Ecommerce”. What is keyword research and why it’s important? Keyword research for Search Engine Optimization (SEO) purposes is the exploration of topics and terms that are related to a subject. It doesn’t matter if it’s an article or website structure. Keywords are the foundation of good SEO. Keywords makeup search strings that users enter into search engines. This can be a single word or a string of multiple words. Search engines use these search strings to try to understand what the user’s intent is and serve the user the information they seek. For example, say a user enters the title of a movie “Star Trek Beyond”. This creates an issue for search engines because the user hasn’t clarified their intent. What information is the user looking for? Reviews, trailers, soundtrack, etc. This is what search engines try to figure out. Google has become the most popular search engine because it does the best at serving up content that is relevant to the search query. Search engines do this by crawling sites and scanning the content for words that best describe the content on the site. These are known as keywords. They take into consideration everything from what your site is about to what type of articles you write. For example, if your site is about “Recipes” and you write a movie review for “Star Trek Beyond” would you expect to rank very high for this keyword? With movie sites like IMBd and CinemaBlend you have zero chance. These sites have thousands of movies listed and sites that link to them. Your site wouldn’t be very relevant to this search query. Remember that search engines primary function are serving up the most relevant results. To do this they look at more than just one page. They look at the keywords associated with the home page, categories, internal and external links, etc. Mastering keywords alone won’t guarantee you first page but get this wrong, and you’re guaranteed an uphill battle. Articles on keyword research have been overdone. They usually focus on different strategies and tools used to do keyword research. Expansion in keyword tools offered. Articles are written by/for the company who owns the tool. Articles are written in collaboration with the company that owns the tool. Companies use this to build relationships so the company with the tool will promote their product. The article is being written as a resource page for the company that owns the tool to attract inbound links to help rank the tool. The problem with these articles is they focus on the tools and strategies, not on the end result. Keyword research isn’t that complicated. Understanding how to properly use keywords when structuring your articles, website, etc. is more complex. To understand keyword research we must think about it in the context of our goal. Keyword research is also an excellent way to generate ideas. So first let’s ask a simple question. How are the keywords going to be used? This is a very important question because where the keyword is used is going to dictate how we do the research. For example, if you already have a website you might be looking for ideas for content or resources. A good way to get ideas is to look at what is working for your competitors. In this example, you might want to use a paid tool like SEMrush. Cost Per Click (CPC) of Keyword. Shows how much a click from Adwords would be worth. Traffic competitors get from each keyword. Click “View full report” and it will give you a massive list of keywords your competitor ranks for along with other metrics related to the keyword. What is your goal? Do you have a website already? As I stated earlier questions like these will dictate how to approach keyword research. For this exercise, I’m going to use the material I created for a client with their permission. They wanted to create a “Vape” e-Commerce store with no brick and mortar locations. They didn’t have a website, so my goal was to create a site structure based on keyword research. Create a core list of keywords. It doesn’t matter if you want to design a website or write an article you want to identify your core keywords. The best way to do this is by looking at what the top competitors are currently doing and build on it. There are many keyword tools that could be used. Any tools used in this article will be free so it will be easy for you to replicate what I’m doing. Since this is an eCommerce store I’m going to start by entering “buy vapes” and “online vape stores” into Google and list some of the top results. You could substitute other keywords. The object is to identify top competitors. For this article, I have picked these 4 sites. Now I’m going to open each one and use SEOQuake’s Chrome extension. If you’re using another browser check to see if they have the extension available. It is available for Firefox, but you will have to check for other browsers. Let’s open the first one https://www.vaporworld.biz/. Next, click SEOQuake’s extension “icon” and choose “Density”. Density will give you list of keywords found on the web page and how often used. Here I will look for keywords that I find relevant to my client’s website. The first section you see is “one-word” keywords. On the right side you can click on 2,3, and 4-word combinations for ideas or just scroll down the list. When I start my keyword research I look for “short tail keywords”. These keywords are made of 3 or fewer keywords. They are generally high traffic keywords that are very competitive. When creating a keyword strategy for a site I start with a top down approach. I’m looking for top level keywords my client wants to rank for then work my down by relevance, volume and competition. Manufacturers, suppliers and specific products will be “long tail keywords”. Long tail keywords are usually more than 3 words and have less traffic. These are generally less competitive but can have higher conversion rates. So to begin let’s just look for 1 and 2-word phrases excluding manufacturers and suppliers. These short tail keywords will be used for seeding the keyword list by using tools such as Google Keyword Planner. What we are searching for are keywords that will make up the category headings and also ideas for further content creation such as “vape reviews”. The results give us some good ideas on categories and even content to create for the site. What is the difference between a Vape and E-cig? What is the best starter kit? These are just ideas from a few keywords. Now let’s use a different technique to get more keywords so we can begin structuring the site. 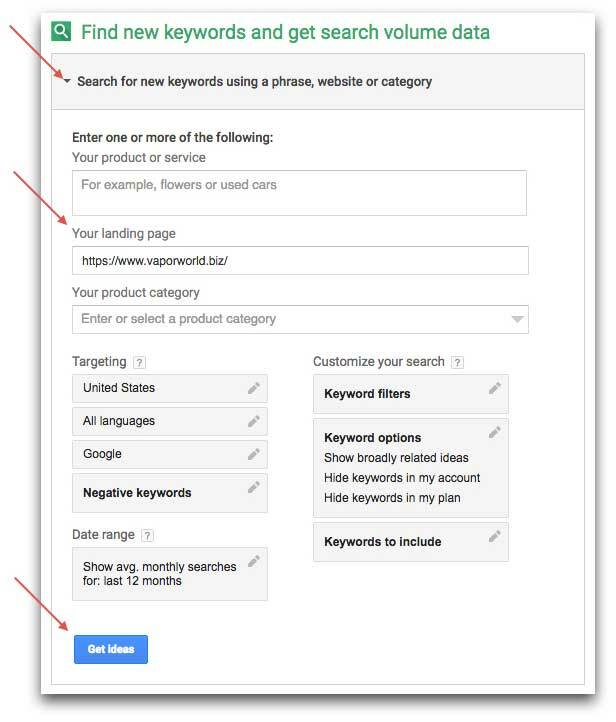 Now open up the Google Keyword Planner click on the box “Find new keywords…”. It is the first choice. We have several options here. We are going to focus on the section labeled “Your landing page”. We are going to enter one of the competitors from the list we created earlier. This will give us a list of keywords associated with this site. Now I’m going to resort the list by Avg. monthly searches so the highest volume is listed first. This is where we can really start picking up good ideas. Remember we are looking for short tail keywords not associated with manufacturers since I don’t know the exact products being offered yet. If we were looking for products we can see “hereakles tanks” would be a great opportunity. Depending on the size of the site and what is offered these could each be categories. The full list has over 700 keywords. If you would like you can download the whole list or click “Add to plan” next to the keywords you want to download. Once you have completed reviewing the keywords you can download the list you created. Now you can open it with excel or add them to a Google Doc. Repeat this process for each website. Once you have them in your spreadsheet remove duplicates and any rows that you don’t find relevant. I only keep “volume”, “competition” and “extracted from”. How to organize your keywords. Now that we have a large list of keywords to work with we need to start organizing them. The first thing we want to do is insert them into an Excel or Google Doc so we can easily sort and filter them. Remember the goal of this keyword research is to design a keyword strategy for an eCommerce site targeting vaping products. The final products haven’t been decided so I’m just designing the short tail keyword infrastructure. I start by visualizing the page (structure) of the website. It might help to look at the competition and what categories they have to get an idea of how to group my keywords. For example, we’ll use http://www.vaporbeast.com/. I specifically picked it because I like the initial structure of this site. The first thing we want to look at is the navigation bar. I’m going to ignore things such as “Brands” since I don’t know exactly what brands my client will offer yet. We will worry about the long tail keywords later. Now hover over each one and look for sub-categories. Below you will see the subcategories for “Accessories”. So now I create a tab for “Accessories” in my spreadsheet and make sure these keywords are listed. Then I will review my keyword list for any other terms that would go under this category. 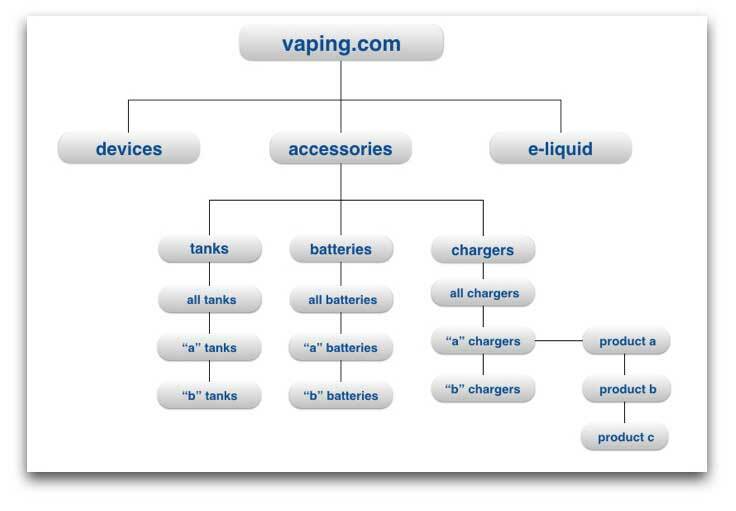 This gives me an idea of traffic potential for the keyword “accessories” in regards to vaping. Keep in mind that each sub-category will have the ability to create its own traffic followed by each brand. For example look at the category “Chargers”. 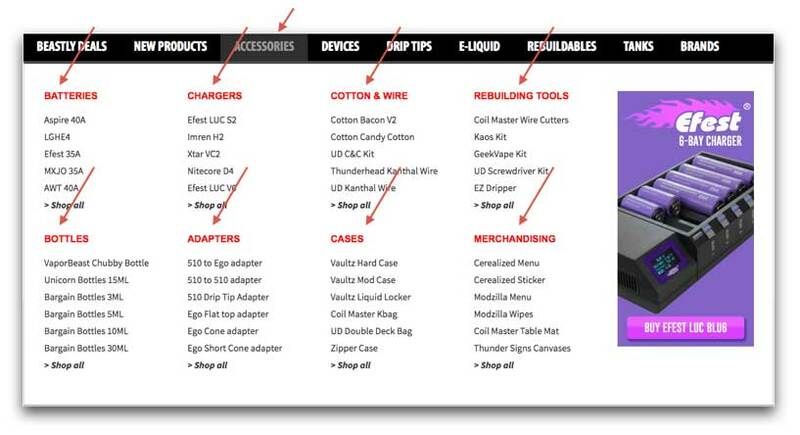 Notice the first product “efest LUC S2”. Efest is a brand name and could be a missed opportunity for this site. If they sell different types of Efest charges they could benefit by having an optimized page for the brand “Efest”. Now I will review the 4 sites I originally looked at when creating the core keywords. I will review them looking for sub-categories just like we did with vaporbeast.com. After reviewing the other sites I found that they really didn’t have much to add to this list. I don’t want to take the time to go over each site and category so let’s create a simple graph and look at some ideas on how the site structure will start to look. Remember that my goal is identifying keywords for my site structure. 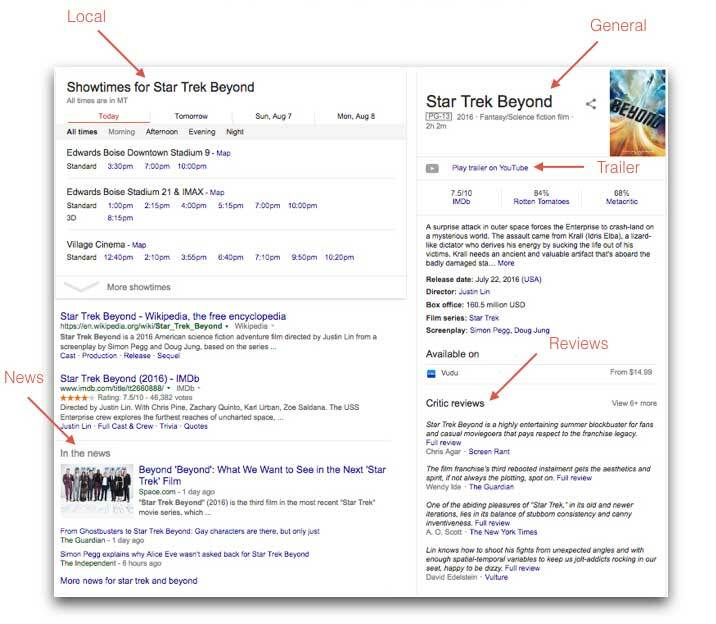 How well these categories will rank and for what keywords depends on competition, content and links these pages have. With this approach, I will be able to optimize multiple pages for my keywords plus it gives me the opportunity to rank for much more. Imagine if the sub-category “chargers” was the last subcategory page and had multiple brands listed. At best I could hope to rank for keywords such as “vape chargers”. When someone is searching for a vape charger they usually have a specific one in mind. An eCommerce site that had a dedicated page to that brand would be more relevant to the query since they would have information and content specifically targeting that brand. So what are some of the keyword opportunities? “all chargers” – Here we can list all the chargers available plus do a write up comparing ratings, performance, guarantee, etc. “a” chargers – This is a brand page where we can list all the chargers under this brand and again do a write up for this particular brand. “product a” Here is where the actual product page lies. We will have the standard images, prices and full product write up along with reviews. As you can see there is a lot of opportunities to optimize at different levels. Think of short tail and long tail keywords as time-based strategies. Long tail keywords are short-term goals. They have less volume and usually less competitive. That isn’t always the case with eCommerce. Short tail keywords are long term goals since the keywords usually have more volume and competition. Something I believe SEO’s overlook is the effect that long tail keywords have on short tail keywords . 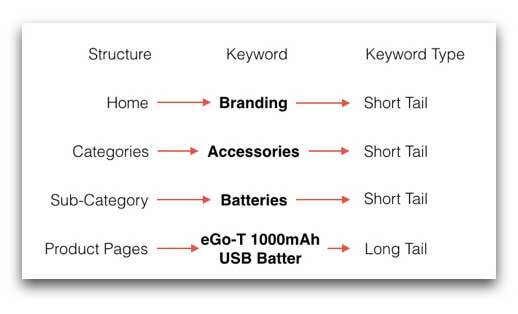 The longer tail keywords have a positive effect on short-term keywords (categories). There are several reasons. For example, when you build links to the lower pages the increase in the Page Authority (PA) of these pages increase the authority of other pages associated with these pages. Keyword research is an exercise in discovery. It’s not rocket science or voodoo it’s just basic Information architecture (IA). Informational architecture is the art and science of organizing and labeling your information. In regards to website design and SEO, it’s making sure that visitors or Google can easily navigate your site in a logical manner. 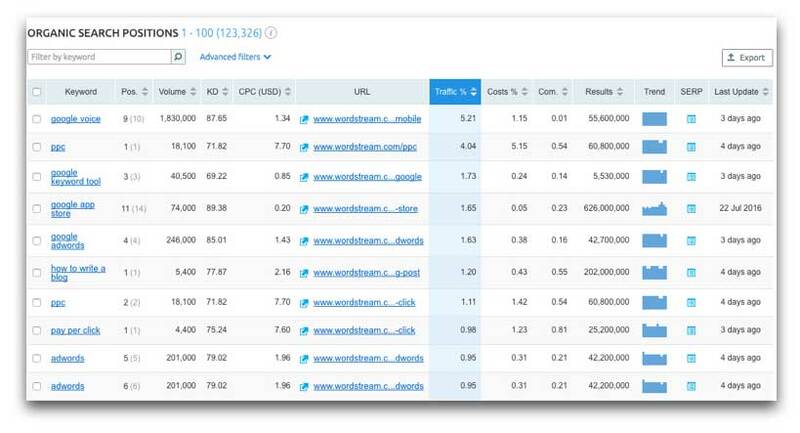 Let’s take a final look at our results from Google’s Keyword Planner. 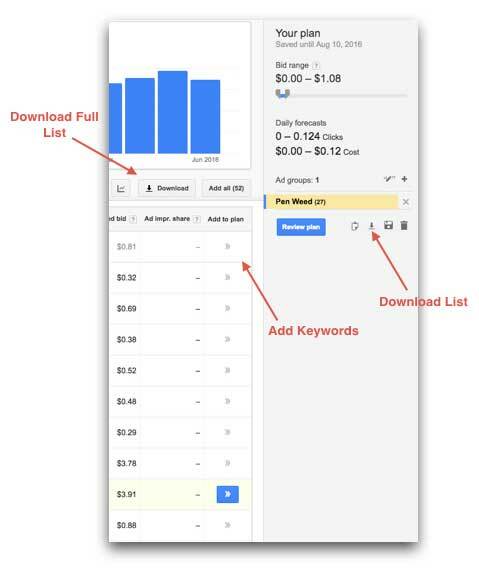 The list we created using Google’s Keyword Planner is information Google delivered to us after scanning the website we entered. It is a list of keywords that it associates to individual pages. So Google is telling us that these are the keywords it finds relevant to the content and other factors. That is valuable information. For example below is a screenshot of 3 keywords from the list I created and put in alphabetical order. Here we can see some of the keywords Google is associating with this page. Now let’s sort the URLs in alphabetical order instead of the keywords. Starting to get the picture? These are keywords this page “http://www.vaporworld.biz/bulk/wholesale-e-liquid-16oz-bottles-50-50-blend/” has a possibility to rank. Of course the quality of the site, links, etc. will be a factor. This gives us the ability to look at our competitor’s pages for keywords and possibly understand how they are targeting keywords. One final note, as your website (content) grows your keywords will expand and change. As it does your keyword strategy will also change. Don’t let keyword research overwhelm you. Keyword research is as much art as it is science. There is no such thing as perfect.